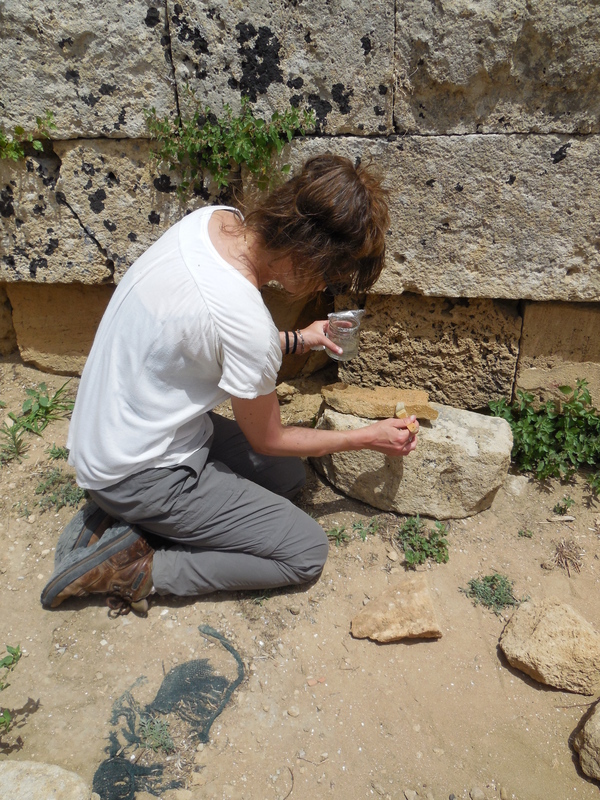 Over the course of summer 2014, I participated in two very different volunteer positions: first, at the Sicilian archaeological site known as Selinunte, and second, at London’s Historic Royal Palaces. Conservation work was carried out for the duration of the field season, beginning on May 26th and ending on June 27th. Much of the conservation work consisted of the treatment of small finds, both those excavated this season and backlog from previous seasons. Materials treated were ceramics and terra cotta, coins, iron, copper alloys, gold and silver, bone and horn. Additional projects included: condition mapping, photogrammetry and minor treatment of Temple R; examination and testing of metals treated in previous seasons; and the documentation and analysis of artifacts from this season and previous seasons (photography, photomacrography, Multispectral Imaging, microchemical spot testing, basic microscopy). 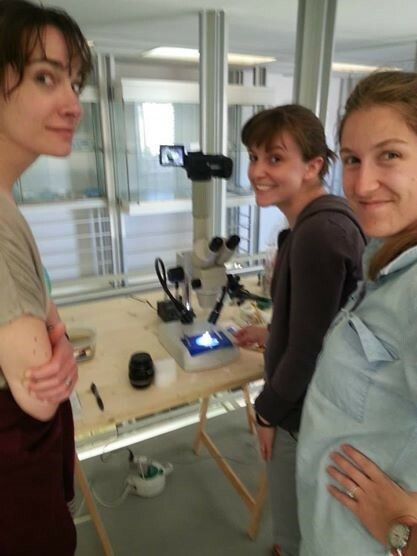 Conservation students Lindsay Dobrovolny, Rebecca Gridley, and Jessica Walthew demonstrating photomacrography in the Baglio Florio lab. Additionally during the field season, an MSI imaging survey using VIS, IR, VIL and UV photography was conducted of architectural fragments at the Palermo Museum and of several terra cotta figurines at the Baglio Florio lab in Selinunte. Multispectral imaging is a non-invasive analytical tool which enables researchers to document and identify traces of pigment on terracotta and stone fragments; I was responsible for drafting MSI protocol for the Selinunte Conservation Handbook as well as an appendix for the 2014 Selinunte Final Report. 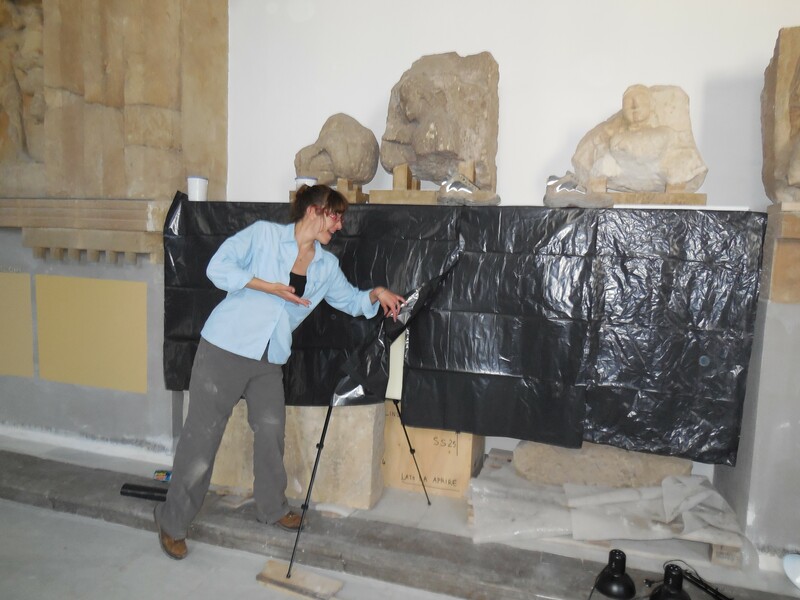 Caroline Roberts and Lindsay Dobrovolny went to the Palermo Museum on June 3rd and 4th to conduct in situ Multispectral Imaging of three polychrome architectural fragments from Temple B. Preliminary examination of Temple R was also carried out during the 2012 and 2013 seasons and a more in-depth investigation was carried out during the 2014 season. The South wall of the temple continues to be of particular concern; many of the blocks exhibit significant spalling, fracture, and granular disintegration. The Southwest corner was watched closely during excavation, as there was concern that the removal of large blocks and supporting soil from the trench in the interior might cause the blocks in this corning to shift. Several stone fragments were found detached from Block W47 on the West face of Temple B. The fragments were reattached with 3:1 Paraloid B-72 and B-48N, each 50:50 in acetone. A documentation campaign was carried out in order to thoroughly record the current condition of the South wall, to establish baseline data to help monitor change over time, and to aid in the planning of future treatment measures. I documented the South wall first with photogrammetry and was responsible for drafting the capture and processing procedures as outlined in Appendix B of the 2014 Conservation Final Season Report. Images from one of the photogrammetric data sets were also used for condition mapping. Images were annotated in layers; nomenclature selected to describe the deterioration phenomena was taken from the ICOMOS-ISCS Illustrated Glossary on Stone Deterioration Patterns (2008). 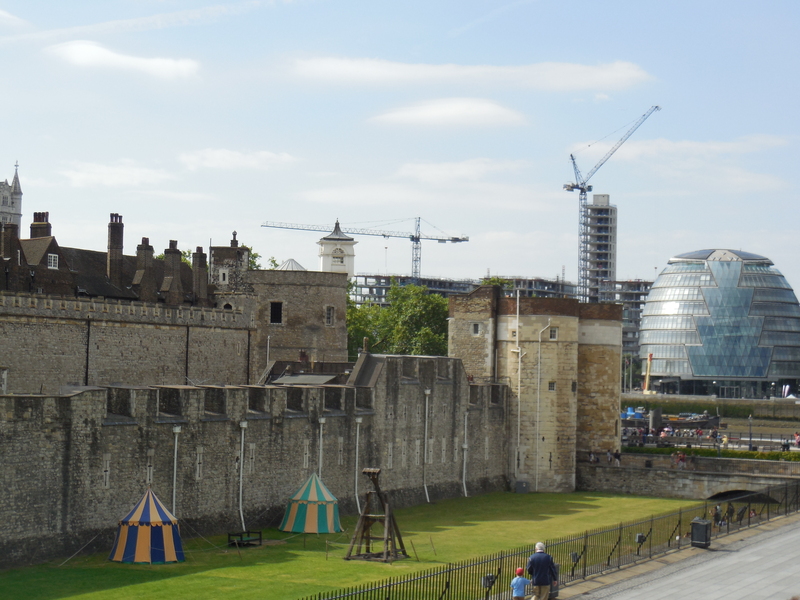 Following my work in Sicily, I was also a volunteer working with Historic Royal Palaces in the Conservation & Learning department based at the Tower of London. Over the course of this internship from June 30th through July 29th I was involved in a number of activities from working with Surveyor of the Fabric Jo Thwaites, to assisting the Curatorial department with archival research and minor conservation tasks. Work with Ms. Thwaites involved basic administrative support and research for the interior of Inigo Jones 1619 Banqueting House project mandate phase 2, a project designed to, “Repair, conserve and re-present the exterior and interior of Banqueting House Whitehall for Q4 2018 to open in 2019 for the 400th Anniversary.” This involvement necessitated my sitting in on several key meetings with contractors and survey consultants; organizing various files associated with design information for the Banqueting House; and compiling a collection of images, buildings and concepts, which characterise the approach and style of several architects of interest to HRP for the creation of a small light pavilion to the east elevation of the Banqueting House. Additionally, I assisted Ms. Thwaites with editing various documents for the July 16th governmental meeting with the Banqueting House Whitehall program board. 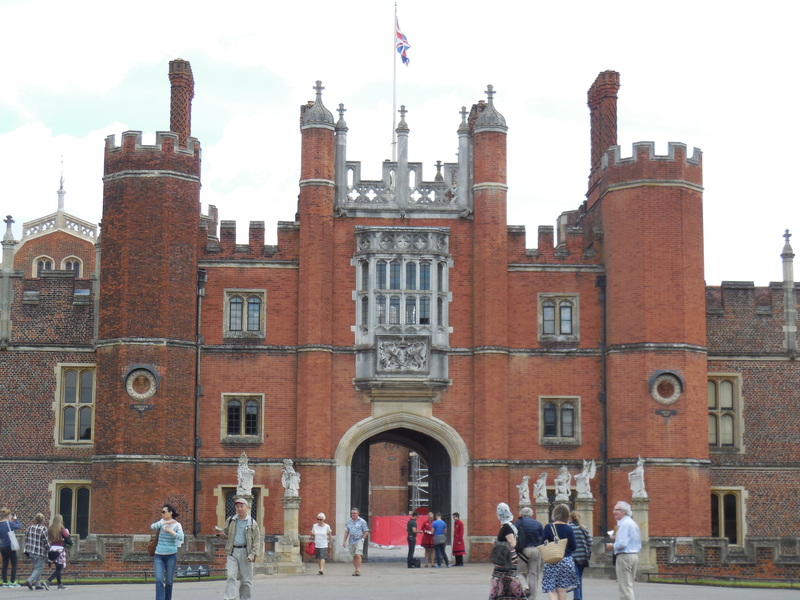 Tudor facade of Hampton Court Palace. 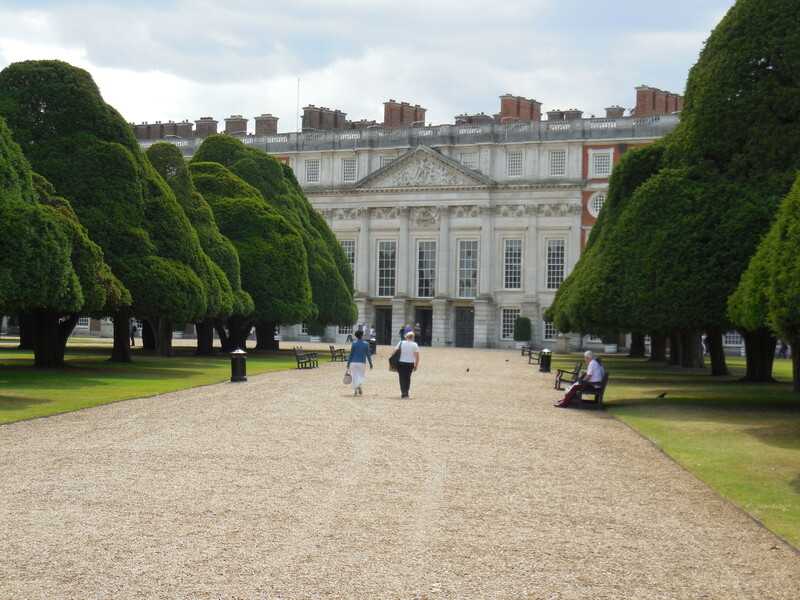 Baroque garden exterior of Hampton Court Palace. My work with the Curatorial department involved compiling and cataloguing information from the 1939 excavations of the Banqueting House of Whitehall. Information associated with the excavation plans was catalogued then integrated into the HRP master database. Additionally, all photographic information noted on the plans was archived and cross referenced with excavation photographs stored at Hampton Court Palace. All photographs were then scanned and all information uploaded to the surveyor Banqueting House database for future archival research. In addition to the aforementioned projects, I also had opportunity for extensive touring of the properties managed by Historic Royal Palaces including, but not limited to: a review of interpretative strategies implemented during the 2006 restoration of Kew Palace and gardens; an architectural tour with Jo Thwaites reviewing restoration work undertaken at Kensington Palace; touring the Hampton Court Palace Magic Gardens archaeological survey work with Fiona Keith-Lewis; a Queen’s House tour with English Heritage representatives at the Tower of London; and the Banqueting House of Whitehall roof survey investigating preventative fire protection measures for the Reuben’s ceiling painting, and an investigation of water ingress. Historic Royal Palaces, Project Mandate for Banqueting House, Whitehall Phase 2 (2014 – 2018).